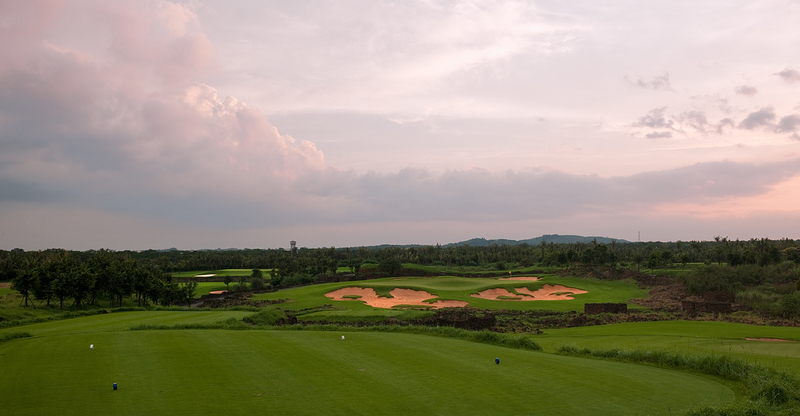 After stunning the golfing world with its 12-course mega complex in Shenzhen, the Mission Hills Group moved to the southern tourist island of Hainan and what was, in many ways, an even more ambitious large-scale development. Gone was the hilly, clay based ground conditions of the previous resort and in its place a 5,000-acre field of black volcanic lava rock. This field, outside Haikou, was about the most inhospitable site imaginable for golf. 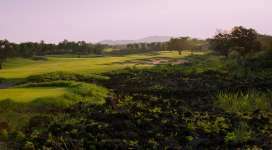 To build a single course on such a property the rock would need to be capped before any shaping or grassing could be done. To build ten courses would literally require a mountain of dirt to be moved. So it was with the Mission Hills Haikou Resort, which opened in 2010 as a ten-course facility complete with a huge five-star luxury hotel and Asia’s largest natural springs Spa. Mission Hills rarely do things by half, and are unafraid to take on big projects like this. As with the Shenzhen development, here again they used architect Brian Curley to masterplan the golf and conceptualize the ten different courses. The difference between the projects, however, was that Curley would get full credit and also full creative license. 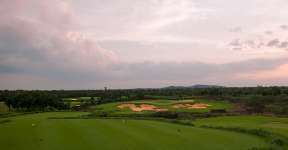 Rather than having to consult or collaborate with professional golfers, like he did at the earlier resort, at Haikou he simply consulted with his experienced design team and came up with a 180-hole routing plan that could be split ten ways. He and his team then conceived of different themes and styles for each of their courses. Few others could have designed ten courses as diverse and as interesting as these, and so quickly. Designing the ten courses was one thing, building them another. During the peak of construction Curley’s team was working 24 hours a day trucking material from a mountainside 25 miles away simply to cap the necessary rock. More than 500 excavators and 2,000 trucks were used during these operations, and ten million cubic yards of clay imported. Despite the sheer scale of the engineering exercise, the topography itself was quite workable, with mostly subtle elevations and some attractive quarries and rock formations. Aside from designing 180 brand new golf holes, Curley’s biggest challenge was looking beyond the rock and identifying natural golf corridors and undulations worth retaining. 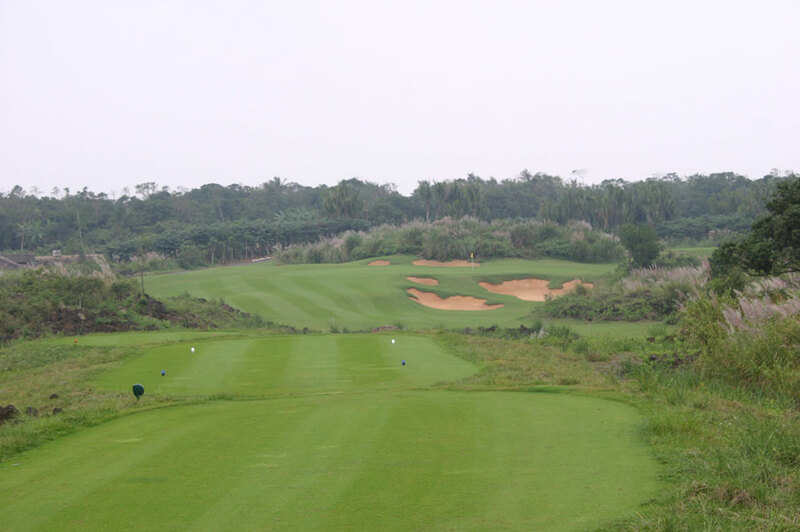 Covering an enormous area, the golf at Mission Hills Haikou is divided into two separate sections, each with their own starting facility, their own par three course and their own “tournament-ready” test. Blackstone is the brute of the northern area, while in the south the championship layout is aptly known as Lava Fields, our pick as the star of the Mission Hills stable. Designer Curley is proud of all ten courses here, but one senses a particular fondness for Blackstone and Lava Fields given he had greater freedom to incorporate the best vegetation and topography into these layouts and to create whatever holes he felt were appropriate. The other courses would then be planned around them. While Blackstone is certainly the more difficult of the two, Lava Fields is no pushover and both more traditional looking than Blackstone and also more strategic. The use of a dirtier bunker sand together with jagged bunkering lines give it a real traditional feel, while fairway width and optimum approach shot angles have been used effectively to create genuine risk/reward options off the tee. 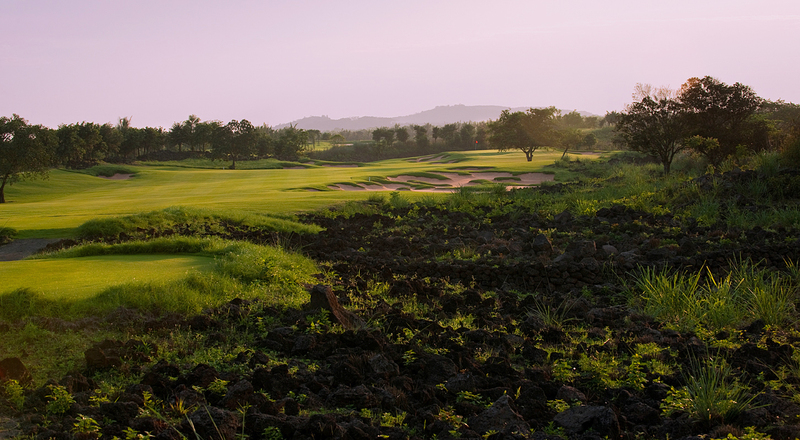 The fun of Lava Fields starts at the very first hole; a broad, heavily bunkered par five with a small undulating target. It ends with a similarly dramatic three-shot hole, and in between boasts a number of stunning double doglegs, some stern carries across rocks and canyons, a fine and diverse set of par threes and a number of glorious elevated approach shots. There is also a fantastic short par four, the 6th, which falls left but bends right and rewards those able to flirt with sand and volcanic rubble by driving bravely down the tighter right-hand side. Other standout holes include elegantly bunkered right-bending par fours at the 3rd and 5th, gorgeous par threes at the 10th and 15th and the strong, rising two-shot 16th, its approach played across a series of spectacular bunkers and into one of the best green complexes on the course. The highlight of Lava Fields, however, is the overall quality of the entire design experience, with the detail work and naturalistic shaping of Curley’s greens and bunkers elevating even the mundane holes into something more exciting and adventurous. 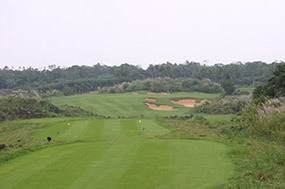 Given Blackstone’s tournament pedigree it is likely to remain the more popular of the two courses at Mission Hills Haikou. For us though, on a hole-by-hole basis, Lava Fields is marginally ahead.